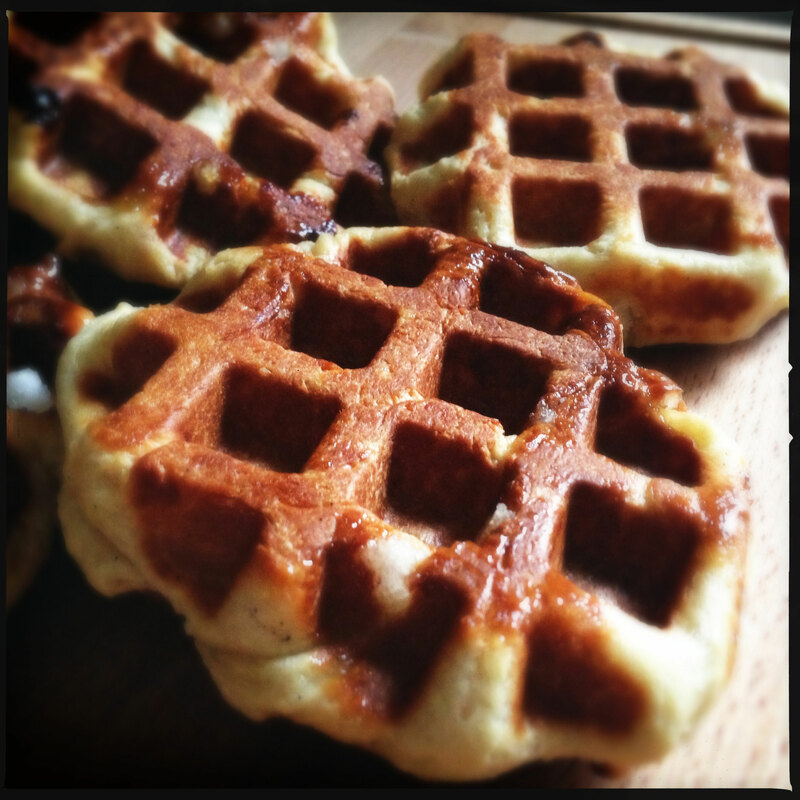 I usually make traditional waffles in the Toastmaster and freeze them for my family. My son likes to boast that he has homemade Eggo waffles for breakfast every morning. While visiting a girlfriend, we made waffles with bacon and Gruyere (I’ll post that one at some point) and they were decadent! Anyway, one day at the market, my son tried a sample of a sweet Belgian waffle. He loved it. I thought it was pretty good too. It reminded me of the waffles I would eat for breakfast when I studied in London. My flat mates and I would slather them with Nutella and jam. There was an immediate request for me to make these at home and I accepted the challenge. I actually found a time consuming yet convincing recipe from a fellow blogger. I couldn’t seem to find the author’s name, I would be happy to give them full credit for the recipe because it’s fantastic. As long as you have a little patience, you won’t be disappointed. 2. Add the egg and 1/3 of the total flour. Mix to blend. Scrape down sides of bowl. 3. Sprinkle remaining flour over the mixture, but do not stir it in. Cover and let stand 75-90 minutes (at the end of that time, you’ll notice the batter bubbling up through the cover of flour). 4. Add brown sugar and salt to the work bowl of a stand mixer. Mix on low speed – just to blend. 5. With machine on low, add honey and vanilla. Then add 2 Tbsp. of butter at a time. Mix 4 minutes at medium-low speed; scrape down sides once or twice in that period. Let the dough rest for 1 minute and then continue to mix for 2 minutes. If you measured your ingredients perfectly, the dough will be sticking to the sides of the bowl in the last minute of mixing and then, in the last 30 seconds of so, will start to ball-up on the paddle. If this does not happen, let the dough rest for 1 more minute and mix for another 2 minutes. Whatever the outcome of the extra mixing, proceed to Step 6. 7. REFRIGERATE FOR 30 MINUTES BEFORE PROCEEDING TO STEP #8. This is essential. The yeast respiration must be slowed before continuing. 8. Stir the dough down (meaning: gently deflate the gases from the dough, by pressing on it with a rubber spatula), scrape it onto a piece of plastic wrap, and then use the spatula to press the dough into a long rectangle. Fold that rectangle over on itself (by thirds – like a letter) so that you have a square of dough. Wrap it in plastic, weigh it down a bit (I put two heavy dinner plates on top of it) and refrigerate overnight. 9. The next day, place the cold dough (it will be quite firm) in a large bowl and add all of the pearl sugar to a bowl. It will seem like a lot of sugar, but it’s supposed to be. Mix it into the dough by hand until the chunks are well-distributed. Once mixed, divide the dough into 5 pieces of equal size. 11. If you have a professional waffle iron (meaning: it’s cast iron and weighs over 20 pounds) cook at exactly 365-370 degrees (the max temp before sugar begins to burn/decompose) for approximately 2 minutes. 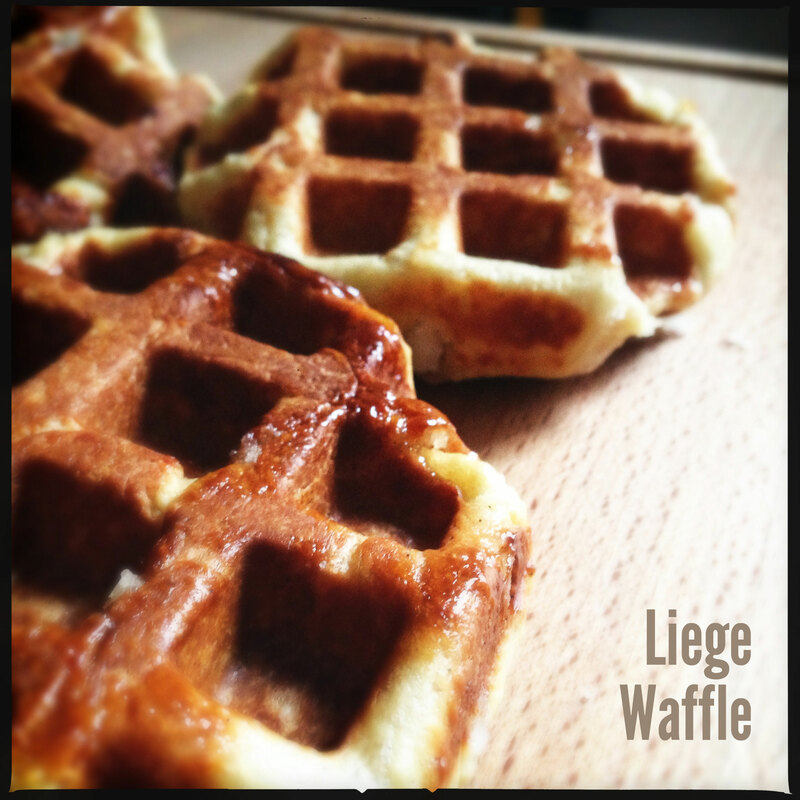 ** Give each waffle a few minutes to cool slightly before eating. No syrup or toppings are needed, unless you’d like to add some fruit or a dusting of powdered sugar; they’re quite sweet on their own.